The folks over at Mac|Life contacted me back in early November for a short interview. 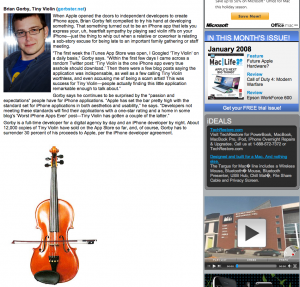 They were writing an article showcasing a handful of iPhone developers and were interested in including Tiny Violin. The online version of the article was published a few weeks ago, and the print version can be found in the January 2009 issue of Mac|Life. Many thanks to Leslie and everyone else over at Mac|Life for giving Tiny Violin all the press. And if you haven’t checked out Mac|Life before, know that you are missing out on probably the best all-things-Mac-related publication out there.